Two storey home in excellent situation with breath-taking views of Lake Wanaka, Treble cone, Black Peak and Mount Roy. Close to swimming bays and stunning cycle tracks and walking tracks. The house has plenty of retro appeal - large open plan dining and lounge area with new sofas, feature stone wall, log burner and high ceilings. Large kitchen with dishwasher, microwave and kitchen dining space. New bathroom with bath shower and separate vanity toilet. Three double glazed bedrooms with panel heating, warm duvets and electric blankets. The lounge catches plenty of winter sun. With a long elevated front balcony and a funky free-standing deck in the rear garden you can admire Wanaka's scenery from all angles. Spacious double garage with generous driveway access and parking. Plenty of space for cars and a boat. fireplace, bedrooms with panel heating, warm duvets and electric blankets. Downstairs is a heatpump. Great property not far from Wanaka itself (walkable if you are inclined! 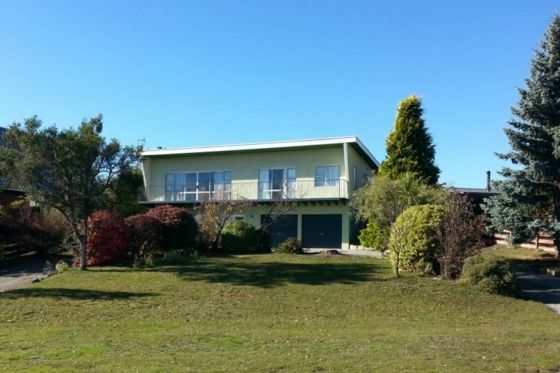 Great property not far from Wanaka itself (walkable if you are inclined!) Was perfect for us as a group of 7 adults visiting the area for a Wedding. Short stroll to the lake. Absolutely loved staying at this house. Large comfortable areas with groovey furniture to step back in time. This home deserves more stars however the cleanliness lets it down. The slated doors were very dusty, under couches not vaccumned propely and cobwebs in lounge room. Cleaners need to up their game. However, beds comfy, linen clean and very warm plenty of heating. Fireplace easy to start plenty of wood but lever stuck to adjust. Lower level there was smell of damp needs attention. It is clean and warm and has all the basics. These days though I expect wifi and better equipment in the kitchen - it is all a bit tired. Thanks for the feedback. I am speaking with the owner about getting wifi. She is ordering some new items for the kitchen. Great house in good location with lovely views over the lake. Great house in good location with lovely views over the lake. Can recommend this place.